Multi-language WebSpellChecker app for Slack is aimed at teams all over the world. 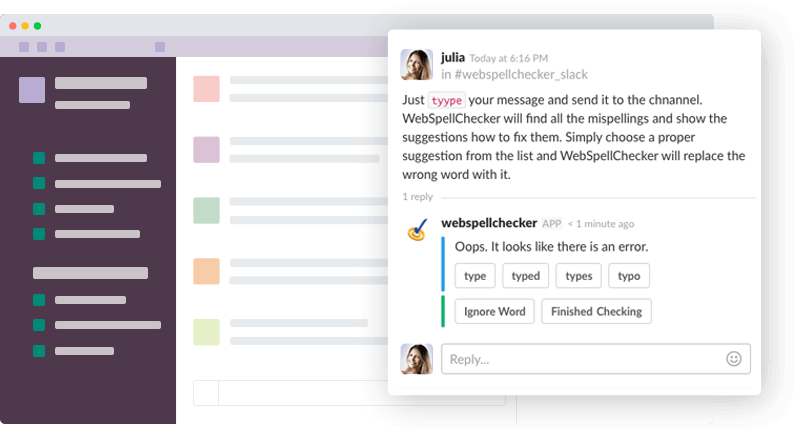 Multi-language WebSpellChecker app for Slack is aimed at teams all over the world. Ensure your team is accurate and professional when typing a message to a colleague or a customer. WebSpellChecker will find mistakes and show how to correct them. Save your team's time for proofreading and enjoy errors-free messages with WebSpellChecker. Just type your message and send it to the channel. WebSpellChecker will find all the misspellings and show the suggestions how to fix them. Simply choose a proper suggestion from the list and WebSpellChecker will replace the wrong word with it. WebSpellChecker enables spell checking capabilities for eight languages. Click Invite others to this channel/Invite team members to join… to invite webspellchecker to your current channel. Enter webspellchecker in the input field and add the bot to invite. Press Invite to add webspellchecker to your current channel. Now webspellchecker is in your channel. Before you start, grant editing permissions to WebSpellChecker. Request the authorization link using the next command: @webspellchecker login and proceed with required authorization steps. Note: You may skip this step if you are the one who added WebSpellChecker application to your Slack team or have already authorized WebSpellChecker in other channel. Use /webspellchecker command to open WebSpellChecker options. Explore the list of available WebSpellChecker commands. Enable WebSpellchecker in your current channel using/webspellchecker enable. Now WebSpellchecker is enabled in your current channel. Just type your message and send it to the channel. WebSpellChecker will not only detect and highlight your mistakes but also show possible suggestions how to fix them. Click reply and explore the thread with suggestions. Replace your misspelled words with correct ones.